The way users are interacting with library and information services is changing and libraries have to work hard to keep up. It’s becoming ever more important for library and information professionals to understand how their users are interacting with technology and to ensure library services anticipate and meet their needs. With this in mind, I pulled together some interesting UK statistics relating to mobile devices and computer use, which I think illustrate some of the key trends impacting on digital library services in 2012. 1 in 40 adults in the UK received an e-reader as a Christmas present in 2011. The Kindle was by far the most popular e-reader gifted, capturing 92% of the e-readers-as-presents market . Interestingly, over 55 year olds were twice as likely as 18-24 year olds to receive an e-reader as a Christmas present, which shows that it is not only the young who are embracing this emerging technology . Research from October 2011 revealed that half the mobile phone owners in the UK owned a smartphone and this figure is expected to reach approximately 90% over the next 2 years . Android currently dominates the smart phone market, with 50% of market share in the 12 week period to 3 October 2011. It is interesting to note how dramatically the landscape has changed in the last few years. As well as Android’s huge rise in market share, Symbian decreased from 39% to 6% over the same period . Although Internet Explorer was still the most popular browser in Nov 2011 with 43% of usage, its dominance has decreased considerably since the heyday of Nov 2009 when it had 60% . Chrome, on the other hand has increased its usage dramatically in the same period from only 5% in Nov 2009 to 25% in Nov 2011 . There have been interesting changes in the Operating System market. Windows 7 currently dominates the Operating System market with 45% of usage . Interestingly, the next largest Operating System is Windows XP with 22%, while its successor Windows Vista lags behind with 18%. In fact, Vista never overtook XP in terms of usage in this period . The usage of Mac OS X has increased from 9% in Dec 2010 to 11% in Dec 2011 . There was no need to provide 2 pie charts to illustrate the search engine landscape in the UK as not much has changed since the start of 2009 . 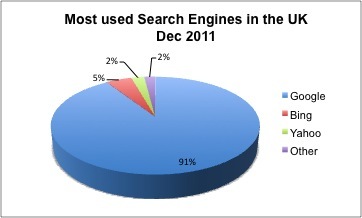 Google continues to dominate with a massive 91% of the usage while the combined usage of the other search engines is 9% . 1. Figures from “Christmas 2011: the day of the Kindle“. Published in the Guardian on 4/1/12. 2. “One in 40 get a Kindle for Christmas“. Published in the Telegraph on 4/1/12. 3. Data from Kantar ComTech World Panel. Published in “How Android swallowed the UK smartphone market in 18 months” in the Guardian on 31/10/11. Many thanks for the vital UK statistics re 2012 library users. It’s a fascinating read and look and shows how fast things are moving and changing re mobile devices and in the computer usage landscape!